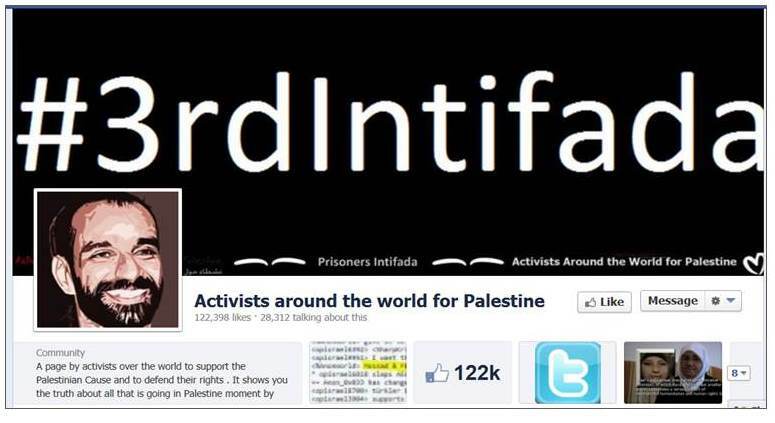 While Anonymous is supposedly motivated by “pro-Palestinian” sentiments, the date they chose for their attacks is obviously revealing. 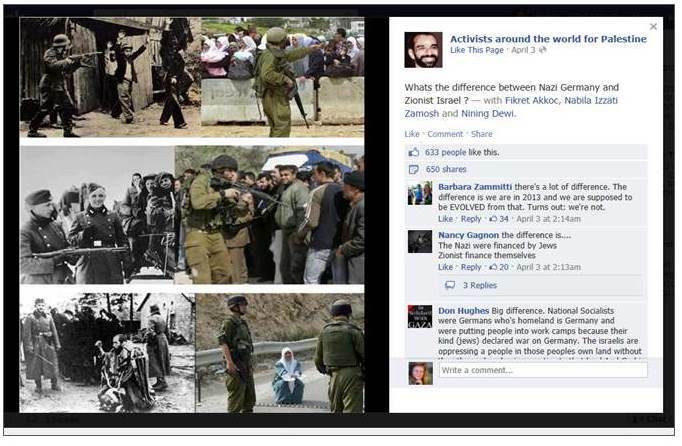 Unsurprisingly, the “Activists around the world for Palestine” also like to compare Israel with Nazi Germany, as illustrated by this post from April 3, which received 633 “Likes” and 650 “Shares;” as the comments posted in response illustrate, “pro-Palestinian” Jew-haters eagerly seized the opportunity to display their bigotry. Meanwhile on Twitter, an account that supports Anonymous and claims to provide “news” – which more than 900 000 people find worthwhile following – entertained its fans last night not just with largely fake “success” stories, but also with the lie that last November, an Israeli Minister had threatened the Palestinian with a “Holocaust”. It’s an excellent example of the kind of “news” anti-Israel campaigners rely on. “A senior Israeli politician warned that Palestinians firing rockets from Gaza into Israel will be punished with a “bigger holocaust” from Israeli armed forces, according to the Telegraph. Anyone who follows the news about Israel closely would of course know that last November, Matan Vilnai was not deputy defense minister – and anyone who doesn’t follow the news about Israel closely but still wants to write about Israel should be expected to check the facts. But apparently, Horowitz was too thrilled when he came across this story to even notice that the article he linked to was from the end of February 2008, when Vilnai was indeed deputy defense minister and made this comment, which – due to his unfortunate choice not to use another Hebrew word for “catastrophe” – caused an uproar. Horowitz also failed to update or correct his misleading post, even though several commenters noted that he was regurgitating an article that was more than four years old. Now, another five months later, Anonymous “news” picks up this fabrication based on a four-year-old report about a stupid choice of words by an Israeli minister and many of their fans eagerly retweet this “news” item. 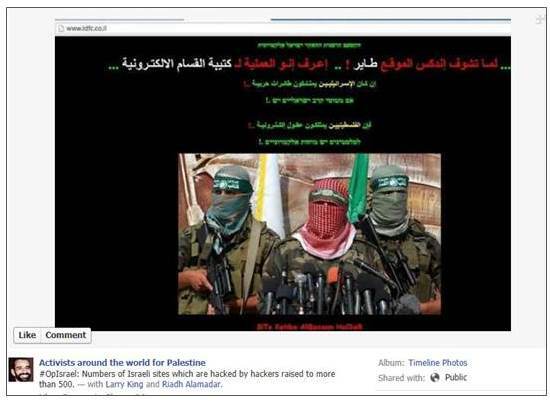 In their weird world, the completely spurious claim that just a few months ago, Israel was threatening the Palestinians with a Holocaust probably provides ample justification for a massive cyber-attack on Israel during Holocaust Memorial Day. You couldn’t find a better illustration of the kind of “news” that is endlessly circulated among the “pro-Palestinian” haters of the Jewish state. This was first published on my JPost blog on April 7. 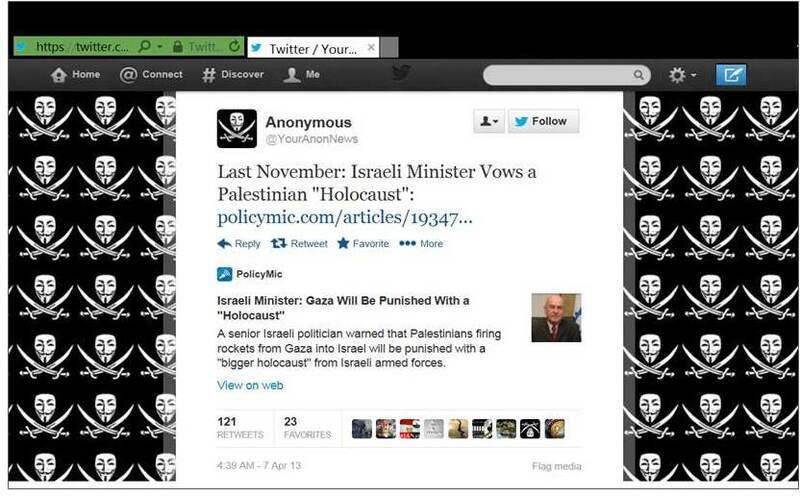 This entry was posted in JPost and tagged Anonymous, Israel, pro-Palestinian, Twitter. Bookmark the permalink.